DomGame.com, an Eastern European online casino and poker room catering to Russian, Polish, German and Hungarian speaking players is extending its popular Free Spins Mania until the end of July. Players will continue to earn free spins every time they make a deposit. DomGame.com, the fastest growing online casino and poker room in Central and Eastern Europe, features weekly Blackjack, slots, video poker and Roulette tournaments. The poker room hosts tournaments including online qualifiers for the European Masters of Poker (EMOP). Customers can use a single wallet to play poker or casino games or to place sports bets. Players that deposit a total of €20 in a week receive 10 free spins on the casino game of their choice. those that deposit €50 get 25 Free Spins and any casino player depositing €250 will get an extra 50 Spins. These free spins are on top of DomGame’s generous 100% First Deposit and 100% Permanent Reload Bonuses. Domgame offers Eastern European casino players a massive progressive jackpot pool that’s growing quickly with every Euro, Ruble and Zloty wagered on designated slots and blackjack games. Twenty different jackpot games including Arabian Night, Mega Fortune, Keno and Bingo currently offer a total jackpot pool of over €1.1. 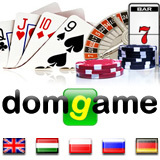 If you've played at DomGame Eastern European online casino, please tell other German, Hungarian, Polish and Russian speaking players what you think of it in the Comments box below.